SIKESTON, Mo. – Weston Rutkowski knew he needed a break, a chance to heal his wounds and refocus his attention, but he had to take care of business first. 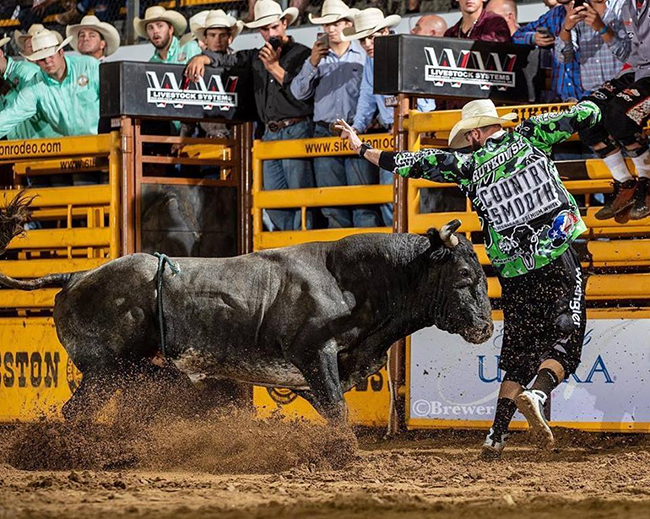 He did that Thursday and Friday by winning both rounds and the overall championship at the Bullfighters Only Wrangler Bullfights Tour stop at the Sikeston Bootheel Jaycee Rodeo. Rutkowski posted the highest-marked fight in the opening round, matching moves with Knox and Cross Dunn’s King Kong for 87 points. He then followed that with a second round-winning 83 to take the crown. “It’s been a pretty long summer, so this was good,” said Rutkowski, the reigning two-time world champion from Haskell, Texas. “I started off pretty hot, then things kind of fell apart for me. I didn’t pick up the wins like I needed to, then I got banged up in Salinas (Calif.). With the victory, he earned $4,200 and moved up to second place in the Pendleton Whisky World Standings. Rutkowski sits only $108 behind Toby Inman of Davis Junction, Ill. The world champion will be crowned at the conclusion of the Las Vegas Championship, held annually at the Tropicana Hotel & Casino and featuring the biggest prize money in the game. Rukowski will take the next month and a half off to get his body back in shape for BFO’s upcoming battles. 1. Weston Rutkowski, 170 points on two fights; 2. Tucker Lane, 164; 3. Beau Schueth, 160; 4. Schell Apple, 156; 5. Toby Inman, 86 points on one fight; 6. Kris Furr, 78.